The day had finally arrived - our return to Slobodskoy! We were very excited as we boarded an early van for the 45 minute ride. Nataliya met us at the hotel - it was so good to see her again. The ride to Slobodskoy flew by as we chatted and reminisced. Misha (our great discipler) met us on the road to Slobodskoy...literally as he had to help the driver get to the hotel, where we would drop off our bags. We arrived at the hotel and the first thing I noticed was that we could drive ALL THE WAY to the door! Everything looks the same, just without the white. Even the orange car that was once buried in three feet of snow just six weeks ago is still there. Although arriving at the hotel without snow stirred certain emotions, it was not until we pulled onto the property of the orphanage that I truly noticed the beauty of the surroundings. A place that looked so dark and bleak at the end of winter was all of sudden green and full of blooming flowers, budding gardens and children playing in shorts and t-shirts on the front lawn. The buildings looked brighter and the sky was even more Carolina blue. It was as if the place had been given a fresh coat of hope and renewal thanks to the arrival of spring. I was amazed at the transformation of this place in such a short time - similar to the transformation that has taken place in the lives our team of travelers. We were warmly greeted by a number of kids - they all knew we were coming and they welcomed us with open arms. Some were more tentative than others, even some of the kids I had bonded with in the past. It was if some of them were not sure how to react - that would all change in a matter of a few minutes. Not surprisingly, the biggest greeting came from our dear friend, Katya K., the talented singer and precious little child. She ran from the building, screaming my name at the top of her lungs and we embraced in one of those long, "I've so missed you friend" hugs. It was a memory I will not soon forget. Galina was right behind the kids, meeting Ernie for the first time and offering her gracious welcome. Before we could drop off our bags, she gave us a thorough tour of the grounds of the orphanage. It is SO MUCH larger than we saw this winter. We got a tour of the new playground equipment provided by Mission 1:27 (more on that later). But she showed us so much more - the work being done on the fence, the blooming flowers and the kids working in the garden. The kids on the new playground - notice all the green!! 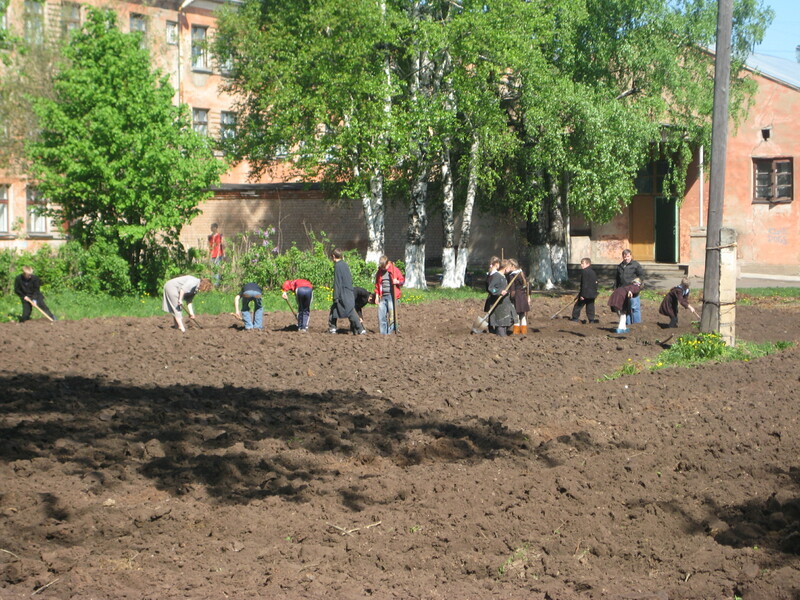 Some of the kids taking their turn in the garden - working in their school uniforms. I saw places that I did not know existed from our last visit. The soccer field, some side playgrounds, and general play areas. This place looked like a typical older school in the US. Galina has instilled a sense of great pride in their physical grounds and the children play a key role in helping make that a reality. After a quick breakfast with Galina while talking about our schedule, we learned that we would spend the first day with the younger children, with the second day focused on the upcoming graduates and their needs. We had planned to teach a class on North Carolina geography - and they spontaneously asked Ernie to teach a class on American English. We spent the rest of the morning teaching our classes. Kendall and Kate helped with the North Carolina presentation, which was very well received. Since we had a projector and speakers, we also showed the "We Miss You" video vignettes that John Cline created (the travelers have not seen this yet), some recent pictures and our Mission 1:27 video. I filmed some of these sessions, including kids saying hello to everyone as a return for your "We Miss You" sentiments. Whatever shyness that might have existed early on was long gone. It was a fun way to get group interaction. After a truly delicious lunch, Galina gave us a tour of the interior of the facility. She wanted to show us some of the changes they have made, in part thanks to the generosity of the donors and supporters of Mission 1:27. This included many news books and chairs for the library, a whole new "stress reduction" room, the ping pong tables and games for the game room and of course, the disco ball!! 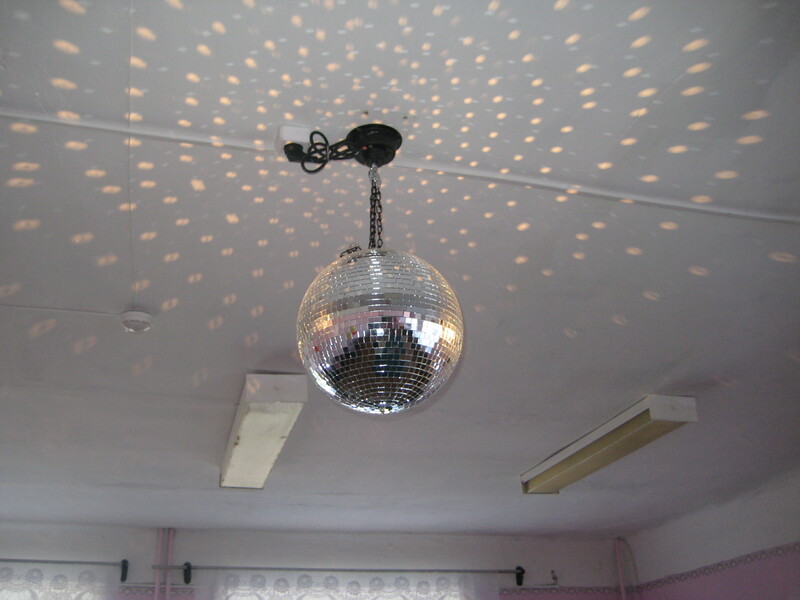 Galina mentioned that at first, the request for a disco ball may have seemed a bit strange. But she mentioned that in many ways, part of her job is to get these kids to feel they are like other kids. These kids are so disadvantaged in terms of opportunities and labels, all of which was out of their control due to life circumstances. So Galina is trying to give them experiences other kids get outside these walls, especially as they transition out of the orphanage to tech school. So since other kids are dancing at school, why can't the kids in Slobodskoy? Galina gets it - these kids deserve the hope, love and experiences that other children get. This disco ball is a reminder to all of us of what's possible in a situation like this. God bless Galina and her vision for what can be done with these special children. Next came some outside activities. We had not prepared for this activity, so we quickly created a scavenger hunt for the kids. We have some wonderful video of them searching for flowers, rocks, something blue, etc. as we frolicked around grounds. After the hunt, we entered into a mini Galympics!! 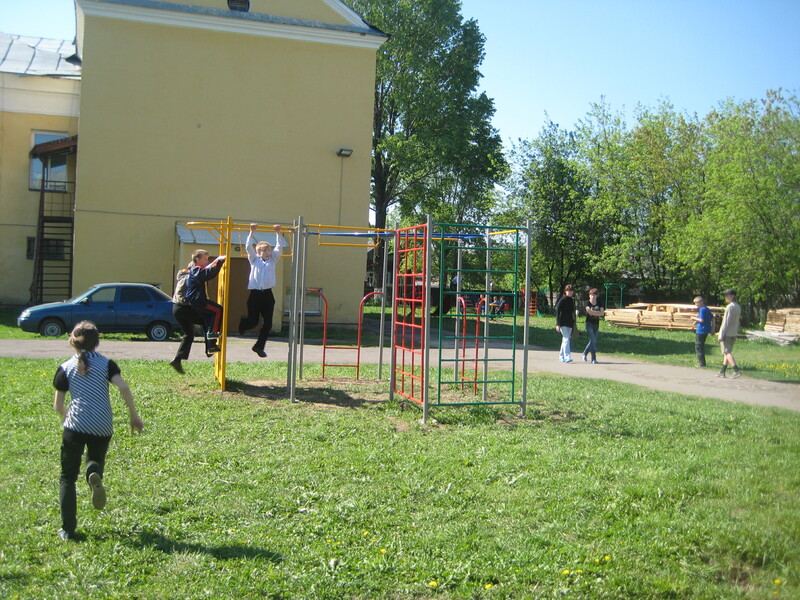 Galina had planned a series of activities utilizing the new playground equipment. Rather than small teams, we included all of the young children on two teams - Team Spartak (coached by Misha) and Team Dynamo (coached by Craig). Ernie was a masterful videographer as we cheered each other on, using traditional Russian and American cheers (bringing back some vintage UVa memories). It was a great time as we laughed, played and generally enjoyed the wonderful weather and warmth of old friends. As the kids ate dinner, we met in Galina's office for tea and cookies. It was a tremendous opportunity to wind down and continue to build a relationship with our new friend. We talked about opportunities and needs at the orphanage and I asked many of the questions posed by future travel teams (I won't bore you with the questions and answers right now). It was a great time of bonding between Galina, Ernie and I. We then had a quick dinner in the cafeteria while the kids enjoyed cookies and milk for a snack.